Most of my viewing this month focused on the Rio Olympics which received the same blanket coverage on the BBC as London 2012. Unfortunately I've ended up with yet another backlog thanks to hours and hours of evening and overnight recordings so although Rio 2016 is over, it will be going on for a bit longer yet in my house....! I was late in discovering "BRIEF ENCOUNTERS" (ITV). The series is now finished but I would be very happy if ITV decided to go with a second series of this drama, set in the early 80s. The basic premise of this show was based around the early days of those Ann Summers parties, but if you were expecting anything trashy and tacky, then think again - it was an extremely engaging drama with characters you couldn't help but root for. Yes it was lightweight, but sometimes that's what you need. Every year it happens: "THE CHASE" (ITV) goes on its summer break and the teatime quiz show slot runs riot with summer pilot/replacements. 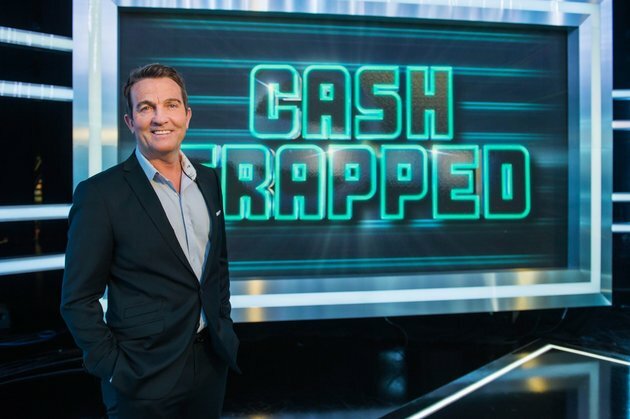 This year we had two of them, both running for two consecutive weeks: "CASH TRAPPED" not only presented by Chase legend Bradley Walsh, but also devised by him too. Unfortunately it was just too confusing to stick with, whilst its successor "ALPHABETICAL" hosted by Jeff Stelling, didn't do enough to hold my attention. It all proves that the formula for quiz show success isn't as easy as it looks. We hardly had time to digest Rachel Frederickson's (controversial) win on "THE BIGGEST LOSER" (Sky Living) before a new series came along. Some changes this time round: out goes Jillian Michaels - in comes Jen Widerstrom and the one and only Jessie Pavelka (Jessie and Jen pictured above). Jessie first came to my attention on "Fat - The Fight of My Life". I make no apologies here for being completely shallow, but if you had this guy as your personal trainer then shifting the pounds would be more pleasure than pain. This series is a change from the usual as it also features former athletes who haven't stayed in shape. Serie 4 of "DAG" (Sky Arts) is here, with its trademark deliciously dark humour still in place. Sky Arts' "TRAILBLAZERS" series brought a very interesting documentary on the influence of pop radio in the UK - from Radio Luxembourg to the 60s pirates, to Radio 1 and commercial radio, and even a mention for legendary 80s Irish mega-pirate Radio Nova, a major obsession of mine back in those days. It was particularly interesting to see former Nova newsreader (and partner of the station's late founder Chris Cary) Sybil Fennell commenting on the station's famous closedown which never fails to bring a tear to the eye whenever I hear that clip.